Ken Henry was forever explaining economic growth, and consequently the strength of the budget, is a function of productivity, participation and population. With the weak productivity growth of recent years likely to continue, the population and labour participation assumptions become crucial – particularly as the Treasurer is forecasting budget surpluses so big that over 10 years they are assumed to wipe out the Government’s net debt. The question must me asked: to deliver the forecast surpluses the government demanded, did Treasury have no choice but to assume a much faster rate of population growth, even if this contradicted the Prime Minister’s congestion-busting rhetoric? Last year, the Government forecast population growth for 2018 at a very brisk 1.6 percent. In the 2019 Budget, it is forecasting this will rise to almost 1.75 percent in each of 2019, 2020 and 2021. It is assumed to remain above 1.70 percent per annum from then on – by far the fastest rate of population growth in the developed world. This assumption is obtained by the Government through a major increase in its forecast for net migration compared to the 2018 Budget when it was forecasting net migration to fall, as well as an extraordinary leap in our fertility rate to 1.9 babies per woman by 2021 – some 0.3 babies per woman higher than the average fertility rate across all developed nations. Most surprising is that this rapid increase in our population growth rate was not explained in the Government’s recently released ‘congestion busting’ population plan which announced a 30,000 per annum cut to the migration program. The Government has instead hidden away this phenomenal increase in our population growth rate in Appendix A of Budget Paper No. 3! Remember when the Prime Minister said ‘enough, enough, enough’ to immigration induced population growth? Well that was so last month. He is now saying ‘more, more, more’ to both immigration and to more babies. You would think any population plan worthy of the name should have explained to Australian families that Government expects them to do their duty and have lots more babies. In fact, we are expected to become one of the most fertile nations in the developed world – enough to make the Pope think we had given up on contraception. Let’s be frank. 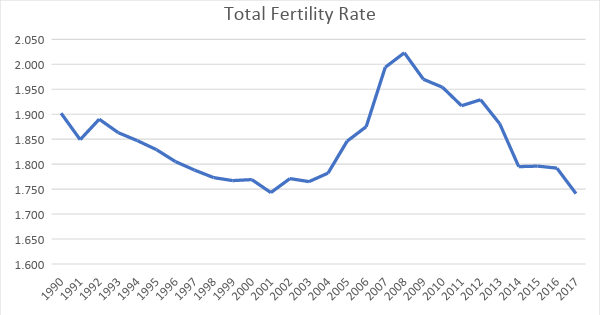 Our fertility rate has been steadily falling since 2010 and reached a record low of below 1.75 babies per woman in 2017 – the latest available data. There is more chance of the Carlton Football Club winning the 2019 AFL Premiership than Australia’s fertility rate reaching 1.9 babies per woman by 2021. But what about net migration. How can it be increasing when the Government has cut the migration program by 30,000 places? Note the migration program counts the number of permanent resident visas issued, while net migration counts the number of people, irrespective of visa status, who arrive and stay in Australia for 12 months out of 16, minus the number of long-term residents who depart and remain outside Australia for 12 months out of 16. Net migration is the way the Australian Bureau of Statistics counts the contribution of migration to our population. It’s therefore what really counts in terms of our rate of population ageing, the economy and the budget. The Government has assumed net migration will rise from 241,700 in 2017 to 259,600 in 2018 and 271,700 in 2019. It expects a slight decline in net migration after that but that is compensated by rising natural increase – the extra babies mentioned above. It is possible to cut the permanent migration program and still see net migration rise if temporary resident arrivals increase markedly while departures remain low, or if there is a major shift in the net movement of New Zealand citizens or Australian citizens. A dramatic improvement in the labour market would be essential to bringing this about. The major unwinding of Peter Dutton’s ham fisted changes to employer sponsored migration (including abolition of the former Sub-Class 457 visas) that David Coleman is implementing would support an increase in net migration. More working holiday makers would also contribute. Another way for net migration to rise is if the massive backlog in spouse visa applications leads to even more foreign-born spouses of Australian citizens and permanent residents deciding they are not prepared to wait offshore for years for a spouse visa but will enter Australia on a visitor visa and apply for a spouse visa onshore. The current chaos in our visa system is also leading to people smugglers bringing in people on visitor visas and then applying for asylum. These people are also be counted in net migration because of the length of time they spend in Australia. The Government may be expecting the record number of such asylum applications in 2017-18 to continue in 2018-19 and 2019-20. We don’t actually know what the explanation is because the Government has provided absolutely no detail explaining the reversal in its forecast of net migration compared to the 2018 budget when it was forecasting net migration to fall steadily. But why has the Government assumed such a rapid increase in population growth? Rapid population growth, particularly through net migration of young temporary entrants most of whom must work to survive, delivers a major benefit to economic and employment growth. They are also a boon for the budget because they pay the full rate of tax but have limited access to government services and benefits. Lots more of these people, as well as faster natural increase generating extra aggregate demand, are how it seems Treasury decided they would deliver the big forecast surpluses the Government wanted. What the Government doesn’t explain is that if the economy slows significantly, net migration will fall like a stone, as it always has in our past. That would leave the Government’s much vaunted surplus and debt repayment plan in tatters. Abul Rizvi was a senior official in the Department of Immigration from the early 1990s to 2007, when he left as deputy secretary.